The most incredible thing about Cream is that they were and continue to be such an influential band and yet their actual lifespan was but a mere three years. However, between those years of 1966-1968 they produced some of the greatest rock music ever recorded and completely changed the way bands approached live performances. They were the first rock supergroup and the first to meld virtuoso musicianship with songwriting sensibilities. For a brief time they were the biggest concert draw in America and one of the top rock bands in the world before exhaustion and animosities blew it all apart. It seemed fitting, if not sad, that a band who burned as intensely as Cream would go down in a ball of fire. Even so, they continue to be revered and influential over fifty years after their demise and are still one of my favorite bands. For this entry in my band profiles series, I'll take you through Cream's career and touch on what they mean to me on a personal level. Cream was formed when three of the best musicians at their respective instruments decided to come together to form a band in order to play the kind of music they wanted to play with the freedom to do it. Eric Clapton (guitar, vocals) had been the first of the Yardbirds famed trio of lead guitarists (the others being Jeff Beck and Jimmy Page) but left the band in 1965 when he deemed their musical direction becoming too "pop." That led him to John Mayall's Bluesbreakers where his combination of fiery blues playing and his sound (a Gibson Les Paul played through an overdriven Marshall amp) led him to be declared "God" by music fans and fellow guitarists throughout London. However, after the release of the legendary album Bluesbreakers with Eric Clapton in 1966, Eric was looking for a new direction and wanted to form his own band. He had two musicians in mind. The first was Jack Bruce, a Scottish classically trained vocalist and multi instrumentalist who specialized in playing bass and writing music. Bruce was heavily into the blues/R&B and jazz scenes in London, playing with Alexis Korner's Blues Incorporatted and most notably, the Graham Bond Organisation. After a brief stint in the Bluesbreakers with Clapton, Bruce moved on to a short tenure with Manfred Mann when Clapton came calling. It was their brief time playing in the Bluesbreakers together that impressed Clapton enough that he asked Bruce to form a band. Bruce leapt at the chance and inquired as to who should play drums. When Clapton gave him the answer, it gave Bruce pause because it was none other than a former bandmate and nemesis of his, Ginger Baker. Baker was a powerhouse drummer who was very well known on the London R&B and jazz circuit of the 1960s. He had formed the rhythm section with Bruce in both Blues Incorporated and the Graham Bond Organisation and while they meshed impeccably together musically, in terms of personalities they were more akin to gasoline and fire. However, Clapton was able to bring the two men together because each of them was eager to play with him. 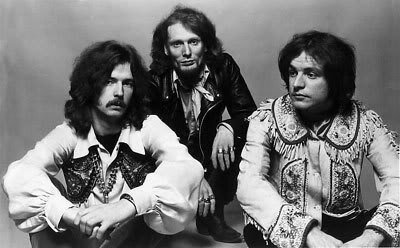 Cream was officially born in July 1966 and took their eventual name because they considered themselves the "cream of the crop" of musicians in London. While they'd sometimes be referred to as The Cream, officially they were just Cream. After weeks of rehearsals and getting some songs together, they made their debut with a warm-up gig at the Twisted Wheel before their formal debut at the Windsor Jazz and Blues Festival at the end of the month. Since they didn't have much original material at this time, their set consisted of blues and R&B covers. Still, they went down a storm and their debut single was one of the most anticipated releases of the year. While everyone was expecting a high-powered electric blues song, Cream instead defied convention (and not for the first time) by releasing the laid back and jazzy "Wrapping Paper." It was perhaps the antithesis of what was expected, but it showed that the band were going to pursue their own direction regardless of what was expected of them. It was also around this time that the songwriting team that would guide the band was former. Poet Pete Brown was initially brought in to form a partnership with Baker but ended up hitting it off with Bruce instead. The Brown/Bruce songwriting team would write the bulk of Cream's original material as well as all of Bruce's solo material until his death in 2014. In October they were joined on stage by a young American guitarist who had just arrived in London and wanted to jam with the band before he put his own band together. His name was Jimi Hendrix and he would quickly become a close friend of Clapton's at the same time that his band would be Cream's chief rival. A second single, "I Feel Free," was released ahead of their first album and was more like what the public expected: upbeat, electric, and intense. It showed Cream's blend of instrumental prowess married to a catchy pop song. Their debut album was finally released in December of 1966 and was full of heavy electric blues and catchy hard rock originals. In addition to cover versions of blues standards "I'm So Glad," "Spoonful," "Cat's Squirrel," and "Rollin' and Tumblin" were great originals like "NSU," "Sweet Wine," and "Sleepy Time Time." While it wouldn't be the best album of their career, it was a fine debut and laid the groundwork for what was to come. In early 1967 Cream went to America for the first time, playing on a bill with The Who and others for Murray the K's bizarre Music in the Fifth Dimension showcase in New York City. In May of that year they returned to New York to record their second album. Disraeli Gears would eventually be released in November of 1967, wrapped in a day-glo psychedelic collage designed by Clapton's artist roommate Martin Sharp. The album was a perfect encapsulation of the merging of psychedelic rock with electric blues and is seen by many to be Cream's best album. It contained their signature song, the pile driving "Sunshine of Your Love," as well as other classics like the bluesy "Strange Brew," the psychedelic mythology of "Tales of Brave Ulysses," and the brooding "We're Going Wrong." There were some wry social commentary wrapped up in bluesy tunes ("Take it Back" and "Outside Woman Blues") as well as the pure psychedelic pop of "World of Pain," "SWLABR," and "Dance the Night Away." The album even closed with an English music hall singalong, "Mother's Lament." The album was eclectic, concise, and masterful and it completely fulfilled the promise that was hinted at with the debut. Around this same time, in August of 1967 Cream played their first headlining concert dates in America. Unbeknownst to them, they were expected to play longer sets than they were used to. Egged on by appreciative audiences and as a matter of necessity in order to fill the time allotted, they began stretching their songs out with wild and fiery improvisations. Word spread and in time they became famous for their high volume and unpredictable jams. This combined with the excellent new material they were writing and releasing contributed to them becoming one of the top concert draws in the US. 1968 would see the release of Cream's magnum opus, the double album Wheels of Fire. It would also unfortunately see the end of the band. They spent the end of 1967 and the first half of 1968 recording the sprawling double album, half of which was made up of studio recordings and half live. The studio cuts represented the apex of their studio craftsmanship, merging their hard rock and blues leanings with innovative productions and arrangements. Among the songs is perhaps their defining anthem "White Room," which in my opinion is one of the greatest songs of all time and has one of the greatest rock guitar solos ever recorded. Other great cuts are the covers "Sitting On Top of the World" and "Born Under a Bad Sign," Jack Bruce's brooding "As You Said," the psychedelic "Passing the Time," the epic "Deserted Cities of the Heart," and Ginger Baker's grandiose "Those Were the Days." There was also the pummeling riff and social commentary of "Politician," perfect for the tumultuous year that was 1968. As far as the live cuts, the band's version of Robert Johnson's "Crossroads" is one of the greatest live performances ever captured on record. A staple of the band's live set throughout their career, this version was the greatest they ever performed and absolutely smokes. When people talk about Clapton's greatness, this is one of the examples they always use and for good reason. A sprawling "Spoonful," the chugging "Traintime," and Baker's drum workout "Toad" round out the live disc. While Wheels of Fire went on to be a massive seller and topped the charts, by the time it was released the band had decided to split up. There were numerous reasons for this decision, among them: the constant touring schedule their management set up exhausted them; the old animosity between Bruce and Baker reared its head, with Clapton increasingly being caught in the middle playing peacemaker; the effect of the the band's volume damaged Baker's hearing; Clapton wanting to pursue a more song-based direction (and his smarting over a scathing review of his playing in Rolling Stone from around this time); and resentments over Bruce's role as frontman and chief songwriter. And so, at the height of their popularity Cream called it quits. They did a farewell tour of the US in the autumn of 1968, wrapped it up with two shows at the Royal Albert Hall in London in November, and that was it. A final album, Goodbye, was released in early 1969 again consisting of a mix of live and studio cuts and was a fitting farewell for the band. The live side kicked off with a blistering version of "I'm So Glad" and was followed by a sinewy "Politican" and incendiary "Sitting On Top of the World" (where Clapton just shreds). The studio cuts include one of the band's signature songs, the Beatley "Badge" co-written by Clapton and George Harrison, as well as Bruce's psychedelic "Doing That Scrapyard Thing" and Baker's gloomy "What a Bringdown." With that, Cream were no more. Clapton went on to do some session work for Harrison, formed two more short-lived but great and influential bands (Blind Faith in 1969 and Derek and the Dominos in 1970-71) before embarking on a successful solo career. Baker played with Clapton in Blind Faith and formed other groups before embarking on a very colorful and interesting life, while Bruce enjoyed a long and creative solo career before his untimely death in 2014. There was a mini-reunion at their Rock and Roll Hall of Fame induction in 1993 where they played onstage again and then in 2005 the unthinkable happened: a full-blown Cream reunion. They played a series of shows at the Royal Albert Hall in May of that year that were recorded and released on CD and DVD. The shows were warmly received and led to another series of shows that October in NYC. Those weren't as enjoyable for the band and led to a final, irrevocable split. With Bruce's passing in 2014, the door was finally shut on Cream. As for what they mean to me personally, they were one of the first bands that I really, REALLY got into when I was a kid. Growing up and getting into music in the 1980s and 90s, I had heard my dad playing his records of Fresh Cream, Wheels of Fire, and Goodbye for years and I started taking them to listen to myself. By the time I was ten and started teaching myself how to play guitar, I completely immersed myself in Cream's music, playing along to the songs and figuring out the chords and riffs. I couldn't get enough of the studio records, but it was the live stuff that completely blew my mind. One of the things that struck me was how great all three members of the band were. This wasn't like some bands where there's clearly one or more members who are so much better than everyone else. Jack Bruce had this powerful voice that could veer between a growl, a sweet falsetto, and everything in between. Behind it all he played this ridiculously complex yet melodic lead bass guitar that, coupled with his distorted sound, was unlike anything my young ears had heard. Clapton was one of my first guitar heroes and really pushed himself out of his blues comfort zone while in Cream. He still stuck relatively close to his roots with his playing during his tenure in the band and if you had to choose a weak link in the band, he would be the one, but he was never as inventive, fiery, or daring in his playing ever again after 1968. If he had never played another note of music once Cream ended, he would still be regarded as one of the greatest guitarists of all time. As it was for all three members, Cream was the best work they ever did. Baker was just bombastic and thunderous, but when I really focused in on his drumming I heard all sort of intricate patterns, polyrhythms and a deft, dexterous dance of his limbs across the drum kit. It all added up to this wholly unique sound that still raises the hairs on the back of my neck even after having heard their records thousands of times before. Those of you who are fellow Cream fans will know what I mean and those of you who aren't will be in for a treat. If you're so inclined and want to dig deeper, I've also reviewed a very good comprehensive biography of the band as well as the memoirs of Baker, Bruce, and Clapton. I recommend all of those books and especially the most important testament to all of their greatness, the music.